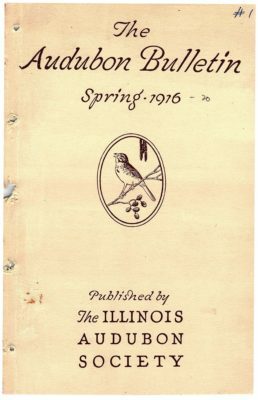 Illinois Audubon Society began publishing, and distributing to members, a periodic bulletin in 1916. For more than 100 years, the society has documented efforts to save the state’s wildlife and native habitats. 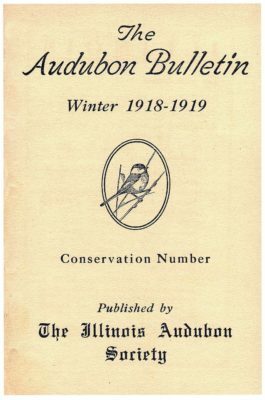 While format and style has changed over the years, we continue this tradition today by documenting conservation actions in our state through the quarterly Illinois Audubon magazine. In 2018 we began the process of digitizing our historic bulletins and magazines. Believing these publications contain the most complete record of conservation in the state, it was important that we took proper steps to protect the information and, more importantly, provide a way to share the information with members, researchers, teachers, students and the general public. As more issues are made available they will be posted here. Highlights from these publications will appear in “100 Years Ago Today,” a new series featured in our magazine. We encourage you to dive in, take a spin back in time and see what may, or may not, have changed across the Prairie State in terms of the conservation of our natural resources. Click on any of the images below to view.